In the continuing saga of exploration hosted by the American Treasure Tour's blog team, we bring you to fascinating destinations within the United States that we encourage you to explore - after you've gotten your fill of our Museum, of course. We've been told that there are more museums in this great nation than there are McDonald's and Starbucks - combined. We're still a little skeptical of that, but if it's true, then we should definitely celebrate them and visit as many of them as possible. Because we just need to get out of the house once in a while, especially now that Summer is right around the corner! Every week, the bloggers here at the American Treasure Tour call out another wonderful destination somewhere in the United States that is worth your time. Because that's just the kind of people we are. So today, we are going to travel south from Oaks, PA. All the way to the First State: Delaware. To Dover. The drive is a good hour from the Treasure Tour on a low-traffic day, but it's definitely worth it if you like music. 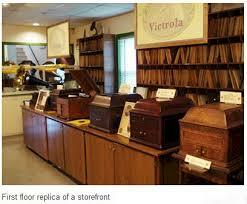 Because that's where the state-run Johnson Victrola Museum is.